The Hanging Tree by Bryan Gruley, a Mysterious Review. 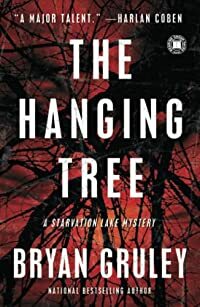 Review: Augustus "Gus" Carpenter investigates the suicide of a young woman who grew up in Starvation Lake but left after graduating high school to attend college in Detroit and had, now eighteen years later, quietly just returned, though for what reason no one knows, in The Hanging Tree, the second mystery in this series by Bryan Gruley. Set soon after the events that take place in the first book of this series, Starvation Lake, Gus's second cousin, and his girlfriend's best friend, Grace, is found hanging from the shoe tree, so named because, over the years, the local residents tossed pairs of shoes into its branches, a tradition started by Grace herself. Though officially ruled a suicide — if a somewhat suspicious one — Gus thinks there's more to the story here. But he's already in hot water with the community and his bosses at the newspaper over his coverage of a planned hockey rink, openly criticizing the developer's motive and questioning his source of funds. Contradicting the coroner's findings on Grace's death won't win him any new friends. Still, his reporter's instincts propel him further, to discover more about her life in Detroit and to learn why she chose to return to Starvation Lake when she did. Readers patient enough to wade through a seemingly endless stream of backstories will be rewarded with a really interesting murder mystery plot in The Hanging Tree. There is so much to enjoy in the story, from the richly drawn characters to the small town setting where everyone — even Gus's own Mother — seems to have a secret to hide, to the well crafted plot that's impossible to predict how it will all turn out, that it's unfortunate the author chose to populate the early narrative with so much tangential information in the form of backstories on the most irrelevant of topics, often at the expense of key plot points that are breezed through, as if unimportant. There are also a few unnecessarily lengthy and detailed play-by-play hockey game scenes that have little to do with the overall story, to add color possibly, but they aren't as intrusive as in the previous book in the series. Where The Hanging Tree excels is in its intricately developed plot that really hits its stride about two thirds of the way through. Just why did Grace return to Starvation Lake, and did she kill herself … or was she murdered? A whodunit, howdunit, and whydunit, all wrapped up in one, really exceptional novel — rather tiresome backstories and hockey games notwithstanding. Acknowledgment: Touchstone provided an ARC of The Hanging Tree for this review.